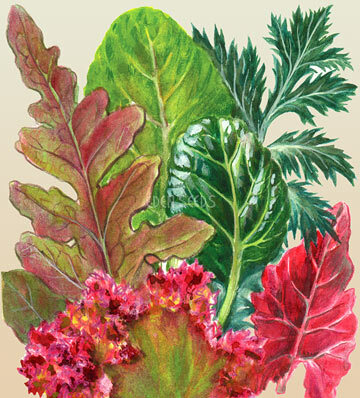 Mild salad mix of greens and reds, usually includes lettuces such as Cos, Brown Romaine, Marvel of Four Seasons, Salad Bowl, also Rocket, Tatsoi, Mizuna and Red Radicchio, ready to start picking outside leaves 25-40 days, grows all year round if sheltered, one packet is enough to start a new plot every few weeks. Add edible flowers. For autumn/winter you might add Endive, or Corn Salad.